If you’d like to have us deliver your new mattress in our delivery vehicle, we can do that for you. (Our delivery vehicles only carry new mattresses as we do not pick up old mattresses.) 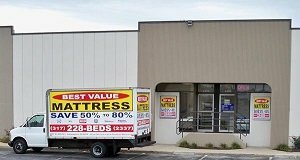 Best Value Mattress offers delivery of your new mattress, box springs and frames within a 50 mile radius of our store on the northwest side of Indianapolis. If you wish and have a suitable vehicle, you may pack up your mattress purchase from our easy loading dock . You may schedule the delivery of your new mattress for the same day or at a later date of your convenience. Some deliveries may need to be scheduled for a crew of two but we run them at various times in a week. Advance, Anderson, Alexandria, Arcadia, Atlanta, Avon, Beech Grove, Broad Ripple, Brownsburg, Center Valley, Cicero, Clayton, Coatsville, Crawfordsville, Danville, Edinburg, Ellettsville, Elwood, Fishers, Frankfort, Galveston, Greencastle, Greentown, Greenwood, Indianapolis, Ingalls, Irvington, Jamestown, Kirklin, Knightstown, Laffayette, Lebanon, Lizton, Martinsville, McCordsville, Meridan Hills, Monrovia, Mt. Comfort, Muncie, New Palestine, Noblesville, Pittsboro, Pendleton, Rocklane, Rocky Ripple, Rushville, Sheridan, Smith Valley, Southport, Speedway, Spencer, Stringtown, Terhune, Thorntown, Tipton, Waterloo, Westfield, Waynetown, Whiteland and Zionsville.